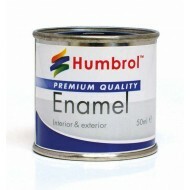 A larger 50ml tin of enamel paint in popular colours. Typically, a 50ml tin will cover an area of 1 square metre. Permanent once dry.